A TYPICAL REACH of the Kiel Canal between Rendsburg and the entrance at Kiel. 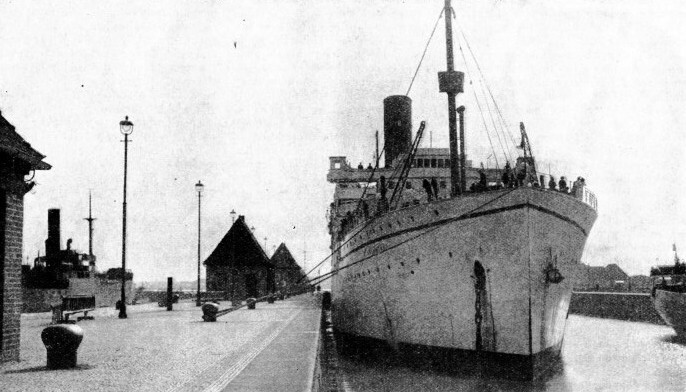 This photograph was taken from the deck of the Royal Mail liner Atlantis, illustrated and described below. The vessel approaching is the Persephone, 8,921 tons gross. She was built at Kiel by Krupp in 1925 and is 468 ft. 8 in. long, with a beam of 63 ft. 3 in. and a depth of 35 ft. 2 in. 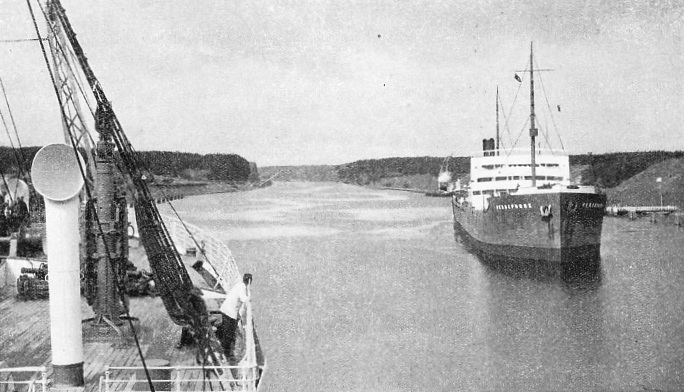 The Kiel Canal is 338 feet wide at water-level. THE Kiel Canal (Kaiser Wilhelm Kanal) links the North Sea with the Baltic, from Brunsbuttelkoog, at the mouth of the River Elbe, to Kiel-Holtenau, in Kiel Harbour. The length of the canal is about fifty-three nautical miles. It is one of the most important strategical canals of the world and its commercial traffic is also important. Operated at sea-level, it has two double sets of locks at either entrance. The canal is owned by the German State and administered by the Reichkanalsamt (State Canal Administration), with headquarters at Kiel. The general direction of the canal from the Elbe is mainly north-east to Rendsburg, where it bends eastwards to Holtenau. There are eleven passing places and four turning places. Pilotage is compulsory, the canal pilots acting as advisers and the responsibility remaining with the master of the ship. The highest speed permitted is 8·1 knots and the lowest is 5·4 knots. Sailing vessels and lighters are towed through by commercial tugs or by tugs belonging to the Canal Administration. Opened originally in June 1895 by the Emperor William II, the canal was afterwards widened and deepened; it was reopened in June 1914. Under the terms of the Peace Treaty of Versailles (1919) merchant vessels and warships of nations at peace with Germany have equal rights of passage, although as foreign warships thus pass through German territorial waters, permission for transit has to be obtained through diplomatic channels. The canal is one of the outstanding achievements of modern Germany. Before its opening ocean-going ships had to go out of German territorial waters and north of the Jutland peninsula of Denmark to get from the Baltic to the North Sea ports of Germany. The canal brought the Baltic port of Kiel as near to the North Sea as the great port of Hamburg, on the River Elbe. Kiel is one of the most remarkable modern ports in Europe. The magnificent harbour is deep, sheltered, spacious and ice-free. Yet before Germany aspired to sea-power the place was a sleepy, old-world town. Directly Germany became naval-minded the port grew rapidly into one of the great naval bases of the world and became the Portsmouth of the German Empire. At one time the town was in the Hanseatic League in the duchy of Holstein. Later it became part of Denmark, but the Prussians annexed it when they took Schleswig-Holstein from Denmark in 1866. The population was only just over 31,000 in the early ’seventies, but by the end of the century, five years after the opening of the canal, it had trebled itself, and in 1917 was over 203,000. The transition from a naval to a commercial port has been accompanied by further growth and the latest figures put the population at over 220,000. In the days of sail the entrance to the Baltic through the Skagerrak and the Kattegat was notorious as “the graveyard of shipping”. Even in these days of steam and oil the Kattegat is an unpleasant place, especially in winter. Navigation of the Baltic is so dangerous, because of ice, shoals and islands, that insurance premiums are high. THE LOCKS AT HOLTENAU, at the eastern entrance to the Kiel Canal. The canal was rebuilt in 1914 at a cost of £11,009,030, and the new locks are 1,082 feet long, 148 feet wide and 39 feet deep. In the background of this photograph can be seen the Prinz Heinrich Bridge for vehicular traffic. The centre span of this bridge has a clearance of 138 feet. The dangers of the passage round the Skaw (the northernmost point of Denmark) prompted the idea of a canal as early as the fourteenth century. It is said that when Cromwell was interested in Denmark and Sweden he considered a scheme; but nothing came of any project until the German Empire began to seek sea-power after the Franco-Prussian War. Strategical reasons alone made the construction of the canal possible. The builders of the new Germany lacked nothing of enterprise, technical efficiency, courage and the will to carry through any project that would benefit their country. They decided to carve their way out of the Baltic. Those who feared the cost and difficulties due to the marshy and treacherous nature of the soil soon became enthusiasts when they realized what the canal meant to Germany in her quest for a “place in the sun”. Marshes and shifting soil were drained and dredged, great embankments were made and road and railway bridges built at high levels to avoid interference with shipping. The high banks of the canal prevent the passenger from seeing the flat, dull country on either side, and in winter, when the wind blows from the Baltic, the canal is bitterly cold. Mariners who have been in the Arctic or the Antarctic and through the Kiel Canal have said that for bitter misery the Kiel Canal is the worst of the three. FROM KIEL TO BRUNSBUTTELKOOG, at the mouth of the River Elbe, the Kiel Canal is fifty-three nautical miles in length. There are two double sets of locks at either entrance. The canal follows a north-easterly course from Brunsbuttelkoog as far as Rendsburg, where it turns eastward to the harbour of Kiel. A number of railway and road bridges cross the canal, but vessels 131 feet high to the top of the mast may safely pass under the bridges. When the canal was being built it was called the North Sea and Baltic Canal, but this name was changed when the Emperor Wilhelm II opened the canal in June 1895. He named it the Kaiser Wilhelm Kanal, after his grandfather, Wilhelm I, in whose reign (June 1887) the canal had been begun. Wilhelm I died in 1888, his son Frederick reigned for only ninety-nine days, and he was succeeded by Wilhelm II, the son of Frederick and of Princess Victoria, daughter of Queen Victoria. The rest of the world called the canal the Kiel Canal, because at the Baltic end was the rapidly growing naval base. Wilhelm II made the opening ceremony a world event and the occasion marked the coming of age of the German Navy. The original cost was about £8,000,000, but the enlargement, completed just before the war of 1914-18, cost about £11,000,000, bringing the total to about £19,000,000. When the canal was opened the warships of the following nations assembled at Kiel: Austria-Hungary, Denmark, France, Germany,Great Britain, Holland, Italy, Norway and Sweden (then united), Portugal, Romania, Russia, Spain, Turkey and the United States. About eighty men-of-war of the most modern types displayed the naval strength of the day and there were 300 yachts and steamers. The ceremony began at Hamburg. The late King George V, then the Duke of York, represented the British Empire. AN ARTIFICIAL OUTLET from the Baltic Sea. 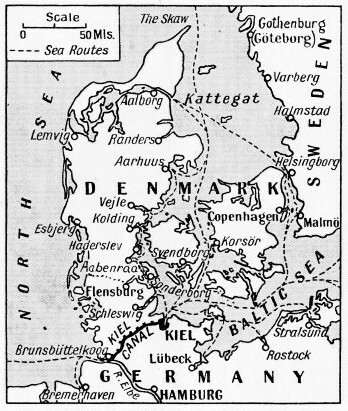 Before the opening of the Kiel Canal in 1895 vessels bound for Baltic ports had to make the long and difficult passage round the north coast of Denmark via the Skaw and the Kattegat. The distance from Hamburg to Kiel through the canal is only 121 nautical miles, against a distance of 646 miles round the coast. The ceremonies were opened with a banquet given by the Senate of Hamburg, at which the German Emperor was present. At either end of the canal the decorations and arrangements were on an extensive scale, and at Hamburg an island was created for a special reason. The German Emperor had supervised every detail of the organization and had arranged the entire programme. When the scheme of the Hamburg festivities was laid before him he said that after the banquet the visitors should go to the Alster Island. The officials looked a little blank, but one plucked up the courage to tell the Emperor that no such island existed. “There is no island in the Alster basin, your Majesty,” he said, “but we can soon make one”. And so the About island was built, at a cost of about £25,000. Some 750 piles were driven and on them was erected an island of canvas, plaster, cement and wire-work, completed with artificial rocks and with accommodation for 1,600 persons. When the work was begun, two swans, it is said, built a nest and two eggs were laid; the mother swan remained at her post, oblivious of the din around her. The imperial pavilion was luxuriously furnished and the pavilions for the guests were scarcely less magnificent. Before midnight the German Emperor left the artificial island in a dispatch-boat and proceeded down the Elbe to the entrance of the canal, where he went aboard the imperial yacht Hohenzollern. The guests followed. A CRUISING PASSENGER LINER, the Atlantis, alongside the quay in Holtenau lock. The Royal Mail Lines, Ltd., employ this vessel for cruises to Scandinavian and Baltic ports, as well as to many other places. A ship of 15,135 tons gross, she is 570 ft. 3 in. long, with a beam of 67 ft. 3 in. and a depth of 33 ft. 3 in. Ships up to 1,033 feet in length and 131 feet beam can use the Kiel Canal. Conforming to schedule, the Hohenzollern entered the locks at Brunsbuttelkoog at 3.30 a.m. next day. Half an hour later she passed out of the locks and her stem severed a cord stretched across the canal, thus officially opening it. Behind the Hohenzollern were twenty-three vessels, including the British royal yacht Osborne. The Hohenzollern started early because she was due at Holtenau just before 1 p.m. Meanwhile the German Empress had arrived at Kiel the previous evening during a thunderstorm and every ship in the great fleet fired an imperial salute of thirty-one guns. In five minutes nearly 2,500 guns roared out, the flames and smoke filling the harbour against a background of storm-cloud in the sky. While the twenty-three vessels were following the Hohenzollern through the canal there were more salutes at Kiel. At 8 a.m. every ship dressed flags rainbow fashion and flew the White Ensign of the British Navy at every masthead in honour of the anniversary of the accession of Queen Victoria. At noon every warship in the fleet fired a royal salute of twenty-one guns, the time being set by the British flagship H.M.S. Royal Sovereign. When the reverberations of the last gun of the Royal salute had died away the British ships flew German ensigns. Promptly at 12.45 p.m. the Hohenzollern steamed out of the locks at Holtenau into Kiel Harbour and the fleet saluted her with an imperial salute of 31 guns. The Kaiseradler followed the Hohenzollern according to plan. Then came an awkward pause, for there was no sign of the Kaiser Wilhelm II, the third vessel in the procession. Rumours flew from forecastle to quarterdeck and so through every vessel in the assembled fleet. One rumour was that the British royal yacht Osborne had stuck; this story was wired to England and printed, only to be indignantly denied the next day. The culprit was the 7,000-tons Kaiser Wilhelm II. This vessel’s screw had fouled the bed of the canal and had “gummed up” with mud. She hurriedly signalled for tugs and they pulled her ignominiously through. The royal yacht Osborne, following her, was saved from going aground by the skill of her officers and ratings. She was kept clear, despite the strong wind that was blowing across the canal. Hours passed and it was not until five o’clock that the Kaiser Wilhelm II appeared. At the last moment, when it was feared she would have to be towed to her allotted position in Kiel Harbour, the Baltic water washed the canal mud off her propeller. She cast off the tugs and took her position under her own steam. Behind her steamed the Osborne, with the Duke of York aboard, and then came the rest of the procession. 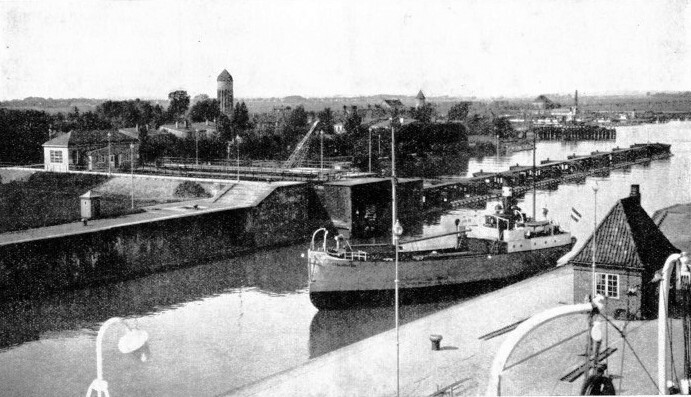 The trouble with the Kaiser Wilhelm II occurred in the bend of the canal at Levensau when the ship was almost at Holtenau. THE ENTRANCE LOCKS of the Kiel Canal from the River Elbe at Brunsbuttelkoog. The Carl Hedrich, seen in this photograph entering the locks, is typical of the smaller coastal vessels that regularly use the canal. Altogether 20,636 steam and motor vessels passed through the canal from Brunsbuttelkoog to Kiel in 1934. In the opposite direction the total number of vessels was 20,601. Every type of ship uses the canal, including warships, cargo and passenger ships, fishing vessels, tugs, barges and sailing vessels. The centre of the festivities at Kiel was the Festhalle, or Festival Hall, built, at the Emperor’s suggestion, to resemble a three-masted ship. The opening of the Kiel Canal showed the rest of Europe that Germany was now a sea-power. Kiel continued to grow. The Emperor gave the port his patronage and even made it a yachting centre, in an attempt to rival Cowes Week. During the war of 1914-18, Kiel became one of the headquarters of the High Seas Fleet. On the conclusion of peace the great port, with its magnificent harbour, was diverted to commerce. The diversion of Kiel from war to trade is one of the triumphs of postwar Germany. The port is divided into four sections: the Old Town Harbour, at the head of the inlet, Wik Harbour, on the south bank, at the entrance to the canal; the North Harbour, inside the canal locks on the south bank; and Vossbrook Harbour, north of the canal entrance. The Old Town Harbour, which serves the town, has a depth of water of 20 feet alongside the 7,550 feet of quay walls. Wik Harbour, which is the free port of Kiel, has a depth of 33 feet alongside the 3,300 feet of berths, and has oil tanks and fuelling equipment. The North Harbour, built above the Kiel-Holtenau bridge, is a masonry quay about a third of a mile long, the depth of water being 28 feet. This harbour has been improved greatly in recent years, and there are a grain elevator, sheds for oil- and cotton-seed cake, and warehouses. Vossbrook Harbour was built on land that the city bought from the German State. This harbour was formerly a building yard for submarines. A breakwater jetty has been built. The principal imports are coal, oil, oilcake, maize, timber, grain, flour, bricks and fish; the chief exports are grain, flour, timber, bricks, salt, manure, machinery and industrial produce. In the days of the Imperial Navy merchant ships were crowded out. After the war of 1914-18 the port authorities set out to attract merchant ships, great and small, and converted into industrial concerns naval yards where great battleships had been built. The Kaiserliche Werft (Imperial Yard), where battleships had been built, became the German Stock Company. This company builds merchant vessels, diesel engines, electric motors, electric and other railway cars, diesel-electric cars, and electrical and steel goods. There are many other works, shipyards and floating and dry docks. The numerous cranes, floating and stationary, lift up to 250 tons. The marine engineering plants of other companies add to the facilities of the port. Its position at the Baltic end of the canal has enabled Kiel to build up a great transhipment trade. Oceangoing vessels do not find it profitable to visit the smaller Baltic ports for small amounts of cargo. They go through the canal to Kiel and unload cargo which is taken to all parts of the Baltic by smaller vessels. From Kiel these smaller vessels link up by regular services with German ports on the Baltic, German North Sea ports, Rhine ports and ports of Denmark, Sweden and Finland. They serve also London, Hull. Rouen and Le Havre. At less frequent intervals vessels go to practically every small port on the Baltic. Considerable distances are saved between certain German ports. The chief reduction by using the canal instead of going round the Skaw is from Kiel to Hamburg, the distance being only 121 nautical miles as against 646 miles, a reduction of 525 miles. The saving in nautical miles from Kiel to other ports is also considerable. In 1934, 20,636 steam and motor ships, with a net register tonnage of 7,781,670 passed through the canal eastbound, and 20,601 vessels, with a tonnage of 8,054,332, passed through it westbound. 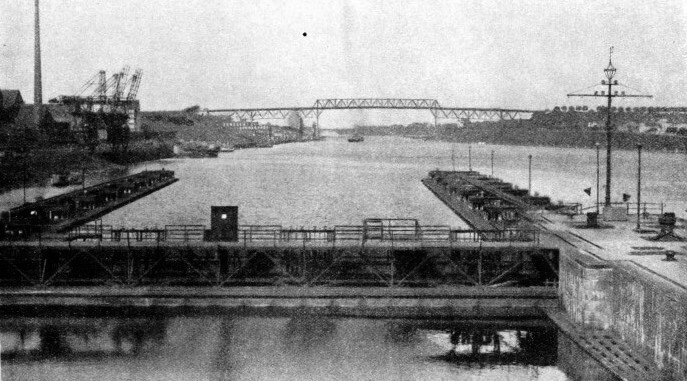 The new locks, completed in 1914, are 1,082 feet long, 148 feet wide and 39 feet in depth. Vessels of the largest size can use the canal by night as well as by day, as the banks are lit electrically. The maximum dimensions for ships are: length 1,033 feet, breadth 131 feet, draught 31 feet and height of masts 131 feet. The locks of the old canal still exist. The width of the canal is 338 feet at water-level and 144 feet at the bottom. The road and railway bridges are fixed structures 138 feet above the mean water level; one swing-bridge was replaced by a fixed bridge in 1933. 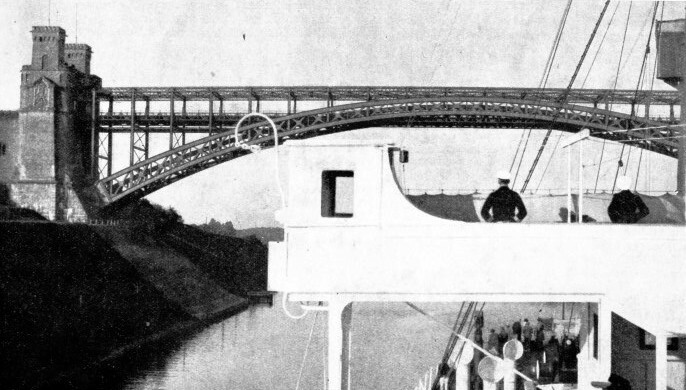 FROM THE NAVIGATING BRIDGE of a passenger liner it often appears that the vessel may not clear the arches of the rail and road bridges that cross the Kiel Canal. The bridge shown in this photograph, taken from the Atlantis, crosses the canal at Grunental. You can read more on “German Shipping”, “The Surrender of the German Fleet” and “World Waterways” on this website.